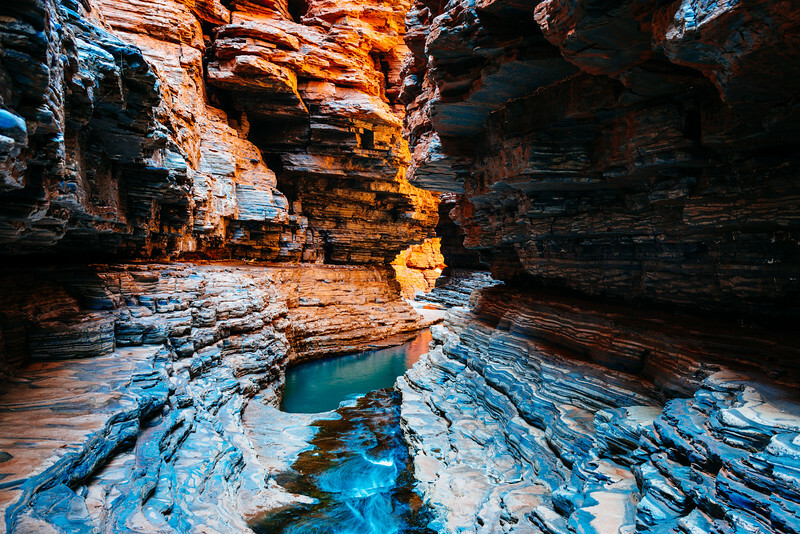 Each step further into the gorges of Karijini National Park is like a step towards the center of the Earth. Each step takes you further down into the gorge; the colors become more vibrant; the rock overhead casts a longer shadow; and the gorge walls begin to narrow, hiding from view what is around the next bend. Nowhere is this more true than the approach to Kermit's Pool in Hancock Gorge. To get to this point you'll climb down into the gorge, scramble over rocks, swim the Olympic Pool or scurry over rocks above a 3 meter drop into deep water, and spider walk along a narrow fissure and through rushing water until the gorge opens up shortly before Kermit's Pool. It is at that opening one encounters this stunning scene. The rocks have been polished smooth from water's constant onslaught over eons, exposing the vibrant colors present due to the high mineral content in the rocks. The different geological layers lead the eye towards Kermit's Pool and the forbidden area beyond. I happened to arrive early in the morning and had several hours all by myself in Hancock Gorge and Kermits Pool. The experience was incredible: just me, the sounds of running water, and an overwhelming sense of tranquility. It was on my hike out that I turned around and captured this image. By that time the sun had risen high enough into the sky to illuminate the gorge walls, turning them a brilliant orange, which contrasted with the cooler rock tones closer to me,and the emerald green water color. Just beyond Kermit's Pool is the rope and sign that keeps people from going further into Hancock Gorge.